Four authors on penning the many dimensions of love. I’m fascinated by the twists and turns of love within family relationships. Can the love between partners be eclipsed by love for a child? Does the way we are loved as children influence our own relationships? I think a mother’s love is the most complicated and important of family loves. In my novel Return to Roseglen, ageing matriarch Ivy Dunmore knows she’s blind to her children’s faults, but she’s powerless to change. Her love is bone-deep, different for each of them, but no less strong. Her eldest child, Ken, holds a special place in her heart, even while she grapples with feelings of guilt. Ivy’s daughters, Felicity and Georgina, share the bond of sisters – sometimes volatile, sometimes judgemental, but always strong. Even menopause, and all the change it brings, can’t break their love. But love becomes more complicated as we age. There’s a point when our parents become the children and we become their carer. This kind of love is different from everything that’s come before. It needs to be patient and kind, gentle and wise, yet sadly, that isn’t always the case. For years the crime of elder abuse has snuck under society’s radar – adult children taking advantage of their parents, manipulating them for their own financial or emotional gain. That’s when the very love that succoured them, protected them, becomes a weapon to be used against their parent. And yet, even then, a mother or a father can make excuses for their children’s faults. In Shakespeare’s words, ‘love is blind’. For me, writing about romantic love is a bit like building a fire. You can’t just throw the big logs on and hope they’ll catch. I start with the kindling to ensure the romance really takes hold. Many readers talk disparagingly of ‘insta-love’ – when the romantic couple have barely met and they’re already declaring undying love. There is a fine line between simmering new love and believability! So the kindling is a series of igniting moments for the lovers – sparkly conversation, eye contact, touch, smell, physical reactions, displays of kindness or chivalry – anything to demonstrate they mean something to one another. I’m also a fan of little handmade or thoughtful gifts to show how well a character ‘gets’ their lover. I’m NOT a fan of extravagant gifts like cars or jewellery because these smack of control: ‘I have chosen this for you and you will use/wear it’ (alpha males send me running the other way). Once the kindling’s burning merrily, it’s time to pile on the big burners. These are the things that test your lovers’ relationship: crisis, rivals, illness, poverty – drama, basically. Their love must be able to stand up to some heavy battering or how can we believe it will last beyond the wedding day? Now’s the time to show how well they comfort or defend one another, or how well they help and support each other through hard times. And how they earn the happiness of true love. And I don’t think writing about romantic love is unrealistic. It can act as an anchor point for a reader: a way to work out if your own love is satisfying, if a new prospect is worth your time, or even if you are in an abusive relationship. Most romance celebrates strong, loving relationships – and that’s healthy, in my opinion! There are many types of love. I was lucky enough to grow up in a tiny town in Western Australia, where ‘the girls’ ran the town like loving village elders. The experience of being held in the collective cradle of their arms has formed who I am today and as such, features prominently in my writing. When you live alongside each other across the years, you learn to be forgiving of each other’s faults. There were many different personalities and a mixture of generations, but the women I grew up with made space for each other and they were always there when they were needed. We lived through all the messiness of life together – bankruptcy, infidelity, substance abuse, illness, divorce. We knew each other’s secrets and the women of my home town accepted and supported each other through it all. One of the girls turned up to do our ironing while Mum was away with her ailing parents, a couple more taught me to play tennis. An older lady taught me to crotchet in the Yealering tearooms. They worked side by side planting trees and flowers in the main streets, pulling weeds from the CWA. They held bush picnics, they drove each other’s kids to boarding school. They say it takes a village to raise a child, but I think that’s becoming rarer now. I was lucky to have been brought up in the bush by wonderful women, who understood the power of community and the power of love. 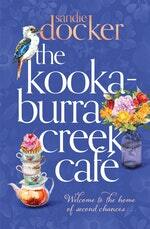 What drew me to write about the bond of female friendships in The Kookaburra Creek Café is just how strong and dynamic that bond can be. Free from the constraints of expectation that can come with other forms of love and the roles we’re supposed play within those relationships, there is something quite magical about female friendships. The BFF who eats ice-cream and chocolate with you into the wee hours of the morning after you break up with your boyfriend; the girlfriend who understands and sympathises when hubby is out of town yet again, and takes you out for lunch; the one who gives you a pendant to help remind you how strong you are when life threatens to reignite your depression; the friend who sits with you in the hospital, buys you food and feeds your dog when your child is in intensive care; the one who reaches out when you’re suffering PND as they recognise it because they’ve been there too. The depth and scope of female friendships is vast and glorious. I love my husband, my daughter and my family with all my heart. No question. Without them I cease to exist. But it’s my girlfriends – that small group of beautiful women who are true and strong – who fill the spaces in between. And it’s those spaces in between that I find most exciting when I write. Heart-warming and charming women’s fiction – the multi-generational story of three women in the small Australian town of Kookaburra Creek.